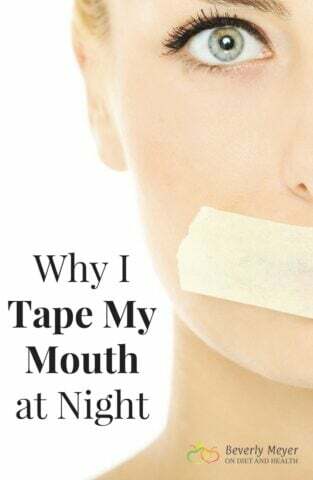 Yes, I tape my mouth at night and you should too. Mouth taping lets you breathe through your nose not your mouth. The difference this makes in sleep, dental health, sinuses, lungs, energy, nitric oxide and carbon dioxide blood levels is staggering. 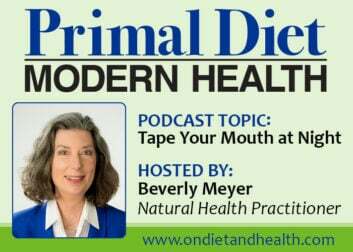 Listen in to my Primal Diet – Modern Health podcast on this topic in the player above or on iTunes. We are designed to breathe through our nose but have modern habits of mouth breathing: open lips, clogged sinus, inhaling through the mouth when talking, and sleeping with an open mouth. Nasal breathing lowers heart rate and Adrenaline and improves blood oxygen levels. 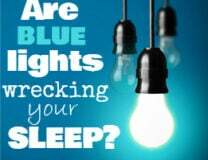 Snoring and sleep apnea can respond to mouth taping (see more Tips on that below). My overnight oxygen levels via Pulse Oximeter readings improved when I started mouth taping. The nose warms, filters and moisturizes air. Mouth breathing sends cold dry air to the back of the throat and lungs. Nasal passages secrete excess mucous trying to alleviate the dryness, causing congestion in the nose and creating more allergies and mouth breathing – a vicious cycle. Mouth breathing dries your mouth, harming the oral Microbiome affecting the entire digestive tract. A dry mouth can lead to cavities as teeth are robbed of their protective coating of saliva and oral pH is altered. Bad breath can result from increased bacteria in the mouth. Mouth breathing can activate the fight or flight response. Learn to stop mouth breathing during the day too. This is a basic health improvement tool that can change your life. Overbreathing can make you sick. It’s not hyperventilation like a panic attack, but the more you watch your breathing and slow it down, the less anxious you’ll feel, day or night. Read more about overbreathing here. We produce 25% of our Nitric Oxide in the sinuses but only when we breathe through the nose. Nitric Oxide is key to athletic endurance and strength, regulation of blood pressure, arterial inflammation, sleep quality and memory. Males may appreciate Nitric Oxide’s ability to relax and open blood vessels throughout the body. Buy paper tape from the first aid aisle in the drugstore. For less sticky residue o n your face, get 3M Micropore tape from Amazon or any medical supply dealer. I prefer the 1″ tape over the 1/2″. 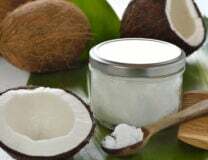 Apply a small amount of an edible oil such as Olive Oil or Coconut Oil to the rectangle of your lips and face where the tape will go. Tear off 3 – 4 inches of tape and fold the ends under to make “handles”. This makes it easy to roll back the tape during the night if you need to cough or say “Good Night”. Gently compress and fold your lips together, tucking them under a bit. Apply the tape several times to your T-shirt to remove excess sticky stuff. Settle it on your mouth and gently puff out to make sure you didn’t miss a spot. 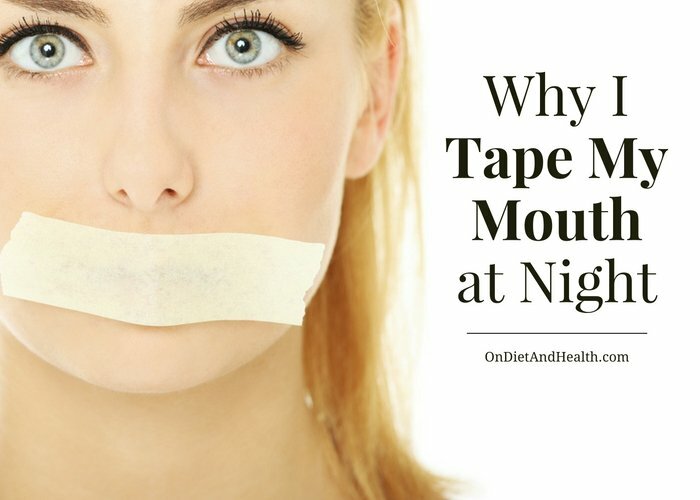 You can try a few “practice” nights by taping the mouth vertically instead of horizontally. You’ll be able to puff air out but it will be harder to mouth breathe. Amazingly, if your sinuses are clogged they may clear right up after 3 minutes or so. 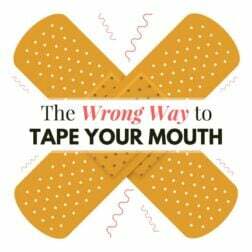 The tape will come unsealed if you cough – simply tap it back into place. Peel it slowly off your face in the morning by rolling it back. Don’t yank it off straight up. Ask your partner to tape too. Put it on together, laugh and make funny faces – just get over it! After a night or two (some people feel nervous at first) you should be able to wake with your mouth still taped. If not…. Treat your allergies with Quercitin or D-Hist, and homeopathic Histaminum. Handle the allergens in your environment, like the cat that sleeps on your pillow… Try a Neti Pot. You may have a chronic sinus infection. Nutribiotic Nasal Spray may help. If you snore, remove Gluten and Dairy from your diet (you should do that anyway) to reduce mucous in the airway. Stop alcohol and lose weight. Try a pillow with a cervical curve that lifts your chin when you sleep. Ask your dentist or ENT doc if you have blockage in your sinus or a deviated septum. Here’s a podcast I did with the world’s top practitioner and trainer for Buteyko Breathing. It’s really helpful if you want to learn more about how breathing affects your life!